Ali Zafar has impressed with his singing skills and also his acting ability and now out in the open is his creative talent relating to sketching. Ali Zafar appeared in the most watched Indian TV show,Kaun Banega Crorepati on Wednesday night.Accompanying him were the Kill Dil costars including the veteran Govinda, the well-known Raveer Singh and the heart throb Parineeti Chopra. 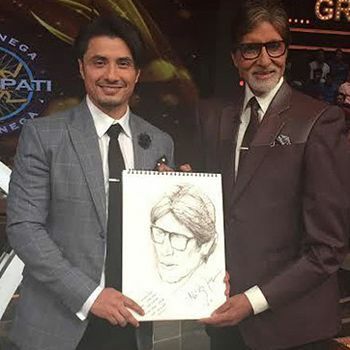 During the course of stay in the TV show, Ali Zafar virtually cast a spell on the superb host, Amitabh Bachchan by showing him a sketch of Amitab, as he looked as a thirteen year old.Ali Zafar had made this sketch himself. In a state of disbelief the great Amitabh urged Ali Zafar to recreate the sketch while on the show. Ali Zafar readily consented and proceeded with making the sketch of there and then. And after a while when Ali completed the sketch, the big host of the TV screen was left spellbound. What emerged thereafter was a big round of applause for Ali Zafar plus a big hug by the legendary actor, thus giving him fulfillment of his dream. It may be added that Ali Zafars film Kill Dil is directed by Shaad Ali and is due for release on 14th of November.